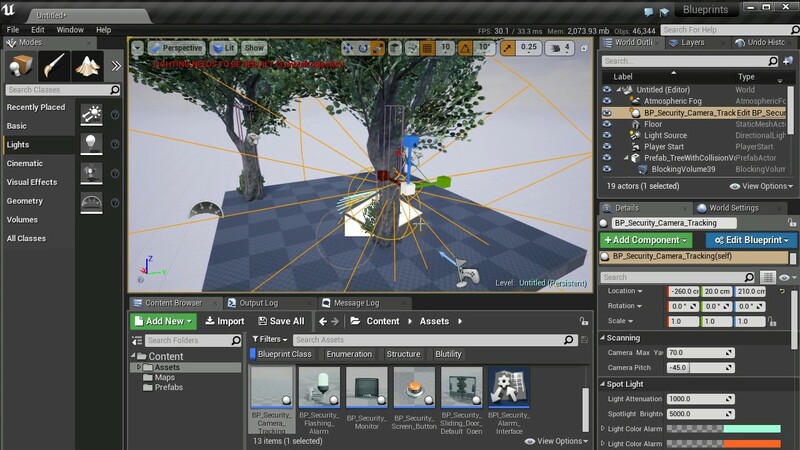 Hi, I've been working on a Prefab solution for Unreal Engine: Prefab Tool. 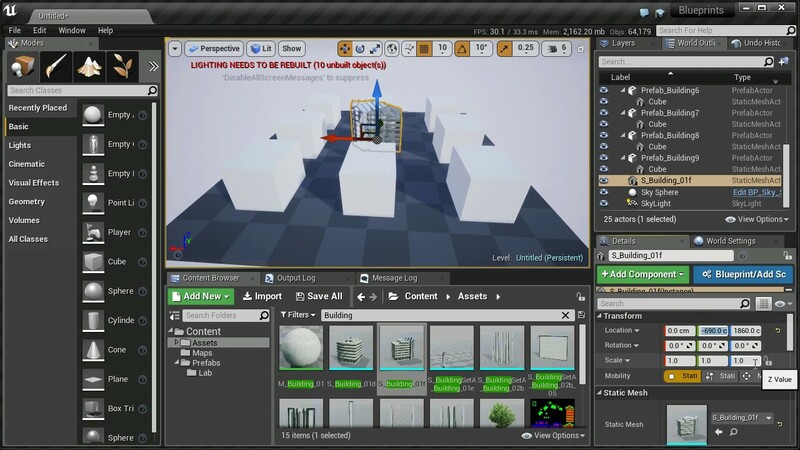 Prefab Tool is inspired by the article: BUILDING THE OPEN WORLD FOR DEAD ISLAND 2 WITH UNREAL ENGINE 4, also the Prefab in UDK. This looks really good! Can you clarify, what is the difference between creating a prefab from actors in the scene vs creating an actor blueprint with those elements and then dragging that BP to the level? Really looking forward to this. Having bought two of your previous plugins I have no doubt this is going to be fantastic. Been missing prefabs from UDK for years. Can you clarify, what is the difference between creating a prefab from actors in the scene vs creating an actor blueprint with those elements and then dragging that BP to the level? Yes.. this please. Is it less resource heavy somehow? Like can I build a makeshift gun out of 3 cubes and then join them as a prefab and then use that as a static mesh placeholder for example? A house like the one described above uses art content like meshes, particle FX, animations and functional content like doors, loot containers, AI spawners, windows, breakable pieces, audio volumes and many more. The combination of these pieces is not something we could easily create with the Blueprint system. So we implemented the AssetGroup functionality. Any combination of objects that can be placed in a level can be combined into an AssetGroup, which then can be drag-and-dropped into a level. AssetGroups can be updated and the changes can be distributed automatically through all our levels. They are also mainly built and maintained by artists and designers. So we wanted to give them a tool they were already familiar with – the level editor. Basically the idea of Prefab is to be used as a level constructing helper. If you're already comfortable with using Blueprint to host child actors in your workflow, then probablly there's no need for a Prefab solution. Is it less resource heavy somehow? No special resources needed, both Prefab Actors and it's Children Actors are just normal actors. When dragging a Prefab into level, a Prefab Actor will be created, then all actors saved in the prefab will be created as children of the Prefab Actor. The Prefab Actor is essentially an empty actor (with editor-only logic to manage children actors), and can be convert to normal actor later if you choose to. And you can also choose to delete the Prefab Actor after placement if you don't need the actor hierarchy. You can make a prefab from the 3 cube actors, and then update the cube actors with final static mesh later. How much will this cost and when can we expect it to hit the marketplace? Does your prefab system allow for editor-only actors? I mean. Can I add actors to the prefab, that I can set to be compiled out of the final build (in case I am using actors who are useful only inside the editor)? The price will be $24.99. I plan to submit to marketplace next week, then it's up to how long the review process might take. As far as I know, there's no way to tag an actor as "editor only" inside editor. You can mark a component as "editor only" to exclude the specific componet from cooking, but I assuem that's not what you want. Actually in my previous prefab implementation (Prefab Tool is my second attempt of Prefab implementation), there's a concept call "Transient" Prefab. Once you mark a Prefab Actor in the level "Transient", all childeren actors under this Prefab Actor will never be savee into map but be generated every time when map opened, which make them never be cooked hence "editor only". But there was may limitations of that particular feature might confuse people and I haven't found useful usecase myself so I ruled out that feature in current version. May I ask what kind of situation you need for editor-only actors? I need it for editor-only content. Actors that procedurally generate stuff depending on their context / location and variable values. The generated content is what I would like to keep in-game. But I wouldnt need the "generators", so I dont want to include them into the final build. Nice work [MENTION=702]Nate[/MENTION]. This is a much needed feature in the engine. Looking forward to the release. [MENTION=28980]Ali Akbar[/MENTION], thanks! Yes, it works only within the editor, via ActorFactory to be precisely. Spawning a prefab actor by using SpawnActor blueprint node and then assign a prefab asset to trigger instances spawning is not implemented but should be easy to do, just that it also only works in the editor so might not be that useful.